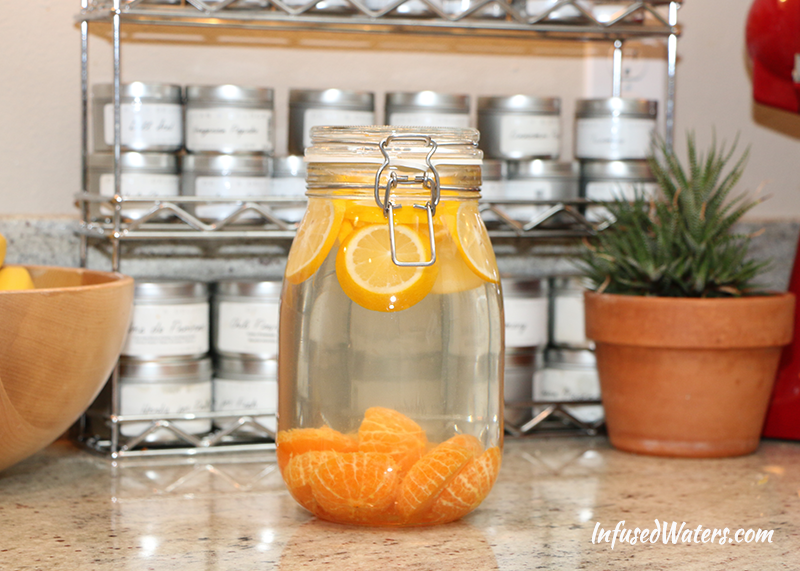 Are you missing fresh fruit flavors in your infused water because of the season? Not to worry! 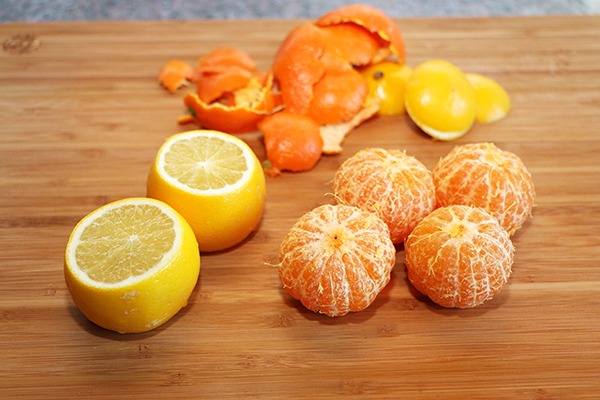 Winter is prime season for Meyer lemons (sweet lemons) and mandarin oranges (also called tangerines). When combined, these two fruits create a zippy, sweet flavor that tastes like sunshine on your tastebeds. Bonus: mandarin oranges are typically inexpensive and can be purchased in large quantities. Recipe for a 34 oz Ikea Glass Jar or a 32 oz Ball jar : 2 Meyer lemons, ends removed and sliced, + 4 mandarin oranges, peeled and halved. 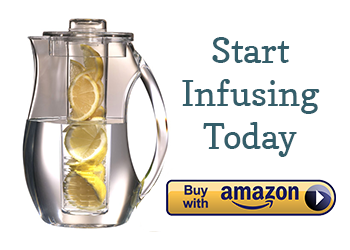 Combine with fresh water and infuse for 2-6 hours. You can remove the lemon peel if you are concerned about bitterness. Both Meyer lemons and mandarin oranges are naturally sweeter than regular lemons and oranges, but if you infuse for too long with the lemon peel on or if you find the finished flavor to be too tart, add a teaspoon of high quality maple syrup for a more palatable flavor. Here are your starting ingredients. Be sure to cut off the ends of the lemons to avoid the extra bitterness from the rind. You can squeeze the juice from the cut-off lemon ends into your mixture. To peel a mandarin orange or tangerine, start at the top and work your way down. Some people can peel a mandarin orange in a single, beautiful coil, but do whatever works for you. Next slice each lemon into 3-4 slices. 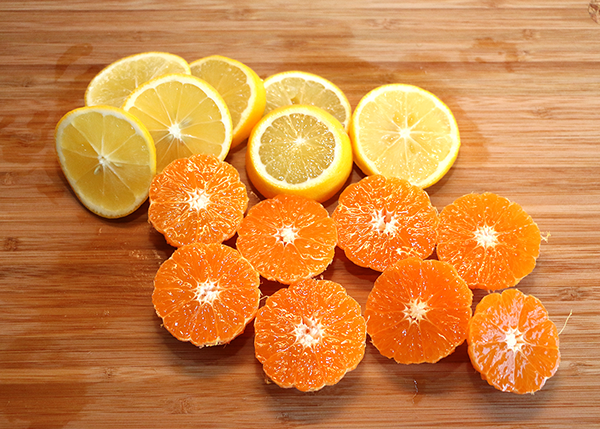 Slice the mandarin oranges in half so that the juice can escape when infused. Just look at how succulent these beautiful, orange orbs are! If you decide to add maple syrup, add it before drinking the infused water and add sparingly. Only use Grade A maple syrup to avoid the taste of your water being affected. Hope this recipe brightens up your winter a little bit! I’ve never tried that combo, but it might be delicious! Sometimes mint can sweeten an infused water in a good way. However, mint does not always go well with lemon. Am wondering if the pesticides the growers often use will hurt if I leave the peels on?? Hi, Sharyn. Pesticides are always a concern if you are not using organic fruit, especially with citrus. However, if you wash the fruit with a vinegar solution and/or scrub the fruit, you can get most of the pesticides off. Another big concern is flavor as citrus rinds become quite bitter when infused, even over the course of an hour. For me, it’s easier to take a knife to the orange or lemon and cut the rind off. Takes about 30 seconds and does not have to be perfect. Good luck! To correct one thing in the recipe-in the first paragraph you state that mandarin oranges and tangerines are the same fruit. They are not the same but are in the same family . They are in the citrus family the same as oranges, lemons, limes, etc. and I am sure they would be interchangeable in this recipe but they are two different fruits. Actually, tangerines are a TYPE of Mandarin orange, as are Clementines (marketed as Cuties and Sweeties), Satsumas (my favorite and the most often canned), Tangelos (a delicious cross between a tangerine and grapefruit). Technically, tangelos are a cross between a tangerine and a pomelo, which is closely related to the grapefruit (thus the -elo part of “tangelo”). I just made lemon/orange/lime infused water. I will be making this recipe next time!! Looks so good! Once my water is gone, am I able to reuse the fruit another time? Like, just adding more water, if so, about how many times? Thanks!! Love the recipes!